What's the difference between R3 turf tires and Galaxy tires? I don't need turf tires but am curious. From the pics I have seen, the galaxy tire looks like a knobby aircraft tire. It has a rounded balloon profile and uses a very small rim in relation to it's overall size. The only places I have seen them used are on golf courses and sandy beaches. I may be thinkin about the older knobby tires? Large dia rims but narrow? Me thinks the rubber compounds are way different also. We had lots of those kind of tires on broom tractors and a couple of other pieces of equipment. They have minimal flex and the rubber is hard as nails. There is a very special turf tire for golf courses mostly. I must have slept in that part of the class. I know what R-3 rice and cane ag tires are. Turf Special tires are designed and built for golf course applications. The Turf Special offers the widest footprint possible without going to costly tires and wheels. Made with the most solid-to-void ratio of any golf course tire, thus giving the least weight per square inch. Built especially flexible and soft with rounded shoulders so as not to cut the turf. The Galaxy Turf Special tires are made with the highest-grade, longest-wearing type of rubber compound in order to yield the longest life. They are mounted on 16.1 inch rims (rears) and are a $1600 option for the 4210,4310 etc. That explanation certainly jives with the pictures in the Deere literature. The lugs on the galaxies are similar in shape to the R3s, but are more densely packed on the tire carcass. Mark, when you mention option price, is that the price to outfit a tractor that you already own with these tires, or is that what they charge when you are equiping a new tractor? I don't know if they include some basic tire in the base price. I always thought "R3" referred to any tire which was designed for LGP (Low Ground Pressure) and minimum disturbance of the ground, in other words bare minimum tread to do the job without shredding or burying itself. 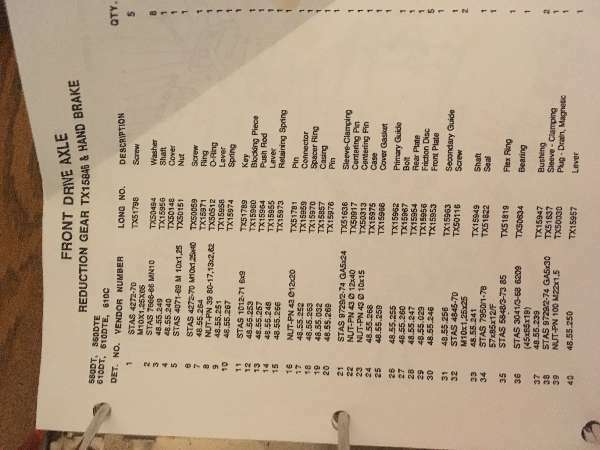 AC, I went through the JD price configurator for a JD MFWD 4310 and it showed the Galaxy tires as a $1200 upgrade over the standard R1s (which are included in the base price). I've got the Galaxy tires on my 4400 and I love them as far as mowing goes they just can't be beat. I also push snow with them and it's a little harder but with 6 to 8 inches at thje most I've had good luck with them.